Meralgia paresthetica refers to the pain along the anterolateral part of the thigh due to entrapment of the Lateral Femoral Cutaneous Nerve as it passes below the Inguinal Ligament. Reviewing the anatomy of the LFCN is essential for understanding the mechanism of its injury. 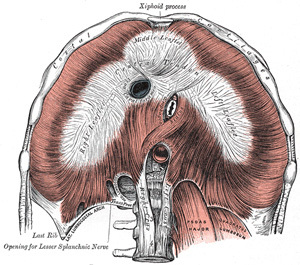 The LFCN originates directly from the lumbar plexus and has root innervation from L2-3. The nerve runs through the pelvis along the lateral border of the psoas muscle to the lateral part of the inguinal ligament. Here, it passes to the thigh through a tunnel formed by the lateral attachment of the inguinal ligament and the anterior superior iliac spine. This is the most common site of entrapment. This is the smaller terminal branch of sciatic nerve. it extends from the superior angle of the fossa to the lateral angle, along the medial border of biceps femoris. Continuing downwards & forwards, it winds around the posterolateral aspect of the neck of the fibula, pierces the peroneus longus & divides into superficial and deep peroneal nerves. The Correct Answer Is : 4.Radio-Carpal Joint. 3, those of the distal radioulnar articulation. This articulation is a trochoid or pivot-joint between the circumference of the head of the radius and the ring formed by the radial notch of the ulna and the annular ligament. The movements allowed in this articulation are limited to rotatory movements of the head of the radius within the ring formed by the annular ligament and the radial notch of the ulna; rotation forward being called pronation; rotation backward, supination. Supination is performed by the Biceps brachii and Supinator, assisted to a slight extent by the Extensor muscles of the thumb. Pronation is performed by the Pronator teres and Pronator quadratus. The shafts of the radius and ulna are connected by the Oblique Cord and the Interosseous Membrane. forms a non movable joint between these 2 bones called a syndesmosis. The movements in the distal radioulnar articulation consist of rotation of the lower end of the radius around an axis which passes through the center of the head of the ulna. Here the controversy exists whether The answer is Middle radioulnar Joint or Radiocarpal joint! The mucous membrane lining the bladder is, over the greater part of the viscus, loosely attached to the muscular coat, and appears wrinkled or folded when the bladder is contracted: in the distended condition of the bladder the folds are effaced. Over a small triangular area, termed the trigonum vesicæ, immediately above and behind the internal orifice of the urethra, the mucous membrane is firmly bound to the muscular coat, and is always smooth. The anterior angle of the trigonum vesicæ is formed by the internal orifice of the urethra: its postero-lateral angles by the orifices of the ureters. Over the trigonum vesicæ the mucous membrane is closely attached to the muscular coat, and is not thrown into folds, but is smooth and flat. Ciliary ganglion is a peripheral parasympathetic ganglion placed in the course of the occulomotor nerve. The motor root arises from the nerve to the inferior oblique (which is a branch of occulomotor nerve). It contains preganglionic fibers that begin in the Edinger westphal nucleus. o Except for C7 (vertebra prominens) that has a long unifid spinous process, all typical cervical vertebrae have a short bifid spinous process. 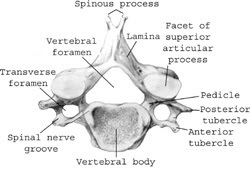 o These vertebrae show a hole in their spinous processes called foramen transversarium. These foramina transmit the vertebral arteries. C7’s foramina transversaria are however smaller and only transmit small accessory vertebral veins. o These vertebrae also show anterior and posterior tubercles at their transverse processes’ extremity. C7’s anterior tubercle is however vestigial and very small. o Grooves (x2) for the exit of the spinal nerves (x2) associated with the vertebra are also present on the superior aspect of the transverse processes. Cervical spinal nerves thus course just above pedicles on their way to exit above their corresponding vertebra contrarily to the pattern respected in the rest of the cord. This is because there is a 8th cervical spinal nerve but no corresponding 8th cervical vertebra. This nerve thus exits between C7 and T1. The diaphragmatic foramen of Morgagni hernia is located posterolateral to the sternum at the site of the internal mammary artery. The hernia usually occurs on the right side but may occur on the left or in the midline; it has also been described as retrosternal, parasternal, substernal, and subcostosternal. It is the least common diaphragmatic hernia and comprises only 3% of all surgically treated hernias. First described by Giovanni Morgagni in 1761, the potential space for the hernia is produced by a congenital defect or weakened area that results from failure of the septum transversus of the diaphragm to fuse with the costal arches. This anatomic defect, best known as Morgagni's foramen, has also been referred to as Larrey's space. It is believed that the congenital foramen (weakened area) gradually stretches and that herniation through the foramen occurs later in life, possibly because of rapid changes in intra-abdominal pressure and aging of the diaphragm. In adults, Morgagni hernias occur most often in overweight middle-aged women and are usually asymptomatic; however, patients may have abdominal or chest discomfort (as in the current case) or dyspnea. Although the hernia usually develops slowly, increased symptoms have been associated with weight lifting or other types of straining. Although considered to be a congenital abnormality, the foramen of Morgagni hernia is rarely diagnosed during the first years of life , and unlike other types of diaphragmatic hernias is only rarely associated with other congenital anomalies. Some evidence has been presented of a possible association between the hernia of Morgagni and trisomy 21 . (4th edition BDC vol 2 page no 312): it is more common on the right side & lies between the pericardium & the Rt pleura. Usually it causes no symptoms. is stronger, but shorter and less oblique in its direction, than the anterior. and passes upward, forward, and medialward, to be fixed into the lateral and front part of the medial condyle of the femur. During flexion, the ligamentum patellæ is put upon the stretch, and in extreme flexion the posterior cruciate ligament, the oblique popliteal, and collateral ligaments, and, to a slight extent, the anterior cruciate ligament, are relaxed. The cruciate ligaments of the knee are intraarticular but extrasynovial structunes. They are covered by a fold of synovial membrane that resembles a mesentery incompletely dividing the knee joint in the sagittal plane. Anatomic studies have not adequately examined the synovial reflections around the cruciate ligaments with regard to whether the anterior cruciate ligament and the posterior cruciate ligament have separate synovial sheaths or a single sheath that envelopes them within the same extrasynovial space. An infant, seen in the ER, presents with a fever and persistent cough. Physical examination and a chest x-ray suggest pneumonia. Which of the following is most likely the cause of this infection? “Although sub threshold stimuli do not produce an action potential, they do have an effect on the membrane potential, Application of such currents with a cathode leads to a localized depolarizing potential that rises sharply & decays exponentially with time. Conversely, an anodal current produces a hyperpolarizing potential change of similar duration. These potential changes are called Electro tonic potentials, those produced at a cathode being called Cat electronic and those at an anode An electronic." Modeling of G-protein-coupled receptors: application to dopamine, adrenaline, serotonin, acetylcholine, and mammalian opsin receptors.Trumpp-Kallmeyer S, Hoflack J, Bruinvels A, Hibert M. Marion Merrell Dow Research Institute (MMDRI), Strasbourg, France. Hydropathicity analysis of 39 G-protein-coupled receptors (GPCR) reveals seven hydrophobic stretches corresponding to membrane spanning alpha-helices. The alignment of the primary sequences shows a high degree of homology in the GPCR transmembrane regions. 3D models of 39 GPCRs were generated using the refined model of bacteriorhodopsin as a template. Five cationic neurotransmitter receptors (serotonergic 5-HT2, dopaminergic D2, muscarinic m2, adrenergic alpha 2 and beta 2 receptors) were taken as prototypes and studied in detail. The 3D models of the cationic neurotransmitter receptors, together with their primary structure comparison, indicate that the agonist binding site is located near the extracellular face of the receptor and involves residues of the membrane-spanning helices 3, 4, 5, 6, and 7. The binding site consists of a negatively-charged Asp located at the middle of transmembrane helix 3 and a hydrophobic pocket containing conserved aromatic residues on helices 4, 5, 6, and 7. To define the precise receptor-ligand interactions, the natural neurotransmitters were docked into the binding sites. Residues responsible for the affinity, selectivity, and eventually stereospecificity of dopamine, adrenaline, noradrenaline, serotonin, and acetylcholine for their receptors were identified. The ligands are involved in electrostatic interactions as well as hydrogen bonds and specific hydrophobic aromatic interactions. All the GPCRs possess invariant hinge residues, which might be responsible for a conformational change during agonist binding and therefore influence dissociation and association of G-proteins to the receptors. The role of hydrophobic interactions and hydrogen bonds in the conformational change of the receptors, modulating the coupling to the G-protein, is discussed with regard to these residues. The models are in agreement with published data obtained from mutagenesis and labeling studies and represent important working hypotheses to direct future mutagenesis studies. They also enable structure-activity relationship studies and more rational drug design. The 3D models of other G-protein-coupled receptors have been generated in a similar way. Kuru is a fatal disease of certain New Guinea natives and is characterized by tremors and ataxia; Creutzfeldt-Jakob disease (CJD) is characterized by both ataxia and dementia. These diseases are thought to be caused by which of the following? Meningitis is characterized by the acute onset of fever and stiff neck. Aseptic meningitis may be caused by a variety of microbial agents. During the initial 24 h of the course of aseptic meningitis, an affected person’s cerebrospinal fluid is characterized by which of the following? One of the most common sexually transmitted diseases that may lead to cervical carcinoma is caused by which of the following viruses? Which of the following is the most sensitive test for the diagnosis of herpes simplex (HSV) meningitis in a newborn infant? A tube of monkey kidney cells is inoculated with nasopharyngeal secretions. During the next 7 days, no cytopathic effects (CPEs) are observed. On the eighth day, the tissue culture is infected accidentally with a picornavirus; nevertheless, the culture does not develop CPEs. Which of the following is the most likely explanation of this phenomenon? The latest and most effective therapy for AIDS patients includes azidothymidine (AZT), dideoxyinosine (DDI), and saquinavir or similar agents. Use of these three drugs would inhibit which of the following viral processes? The bone marrow transplantation service requests a consult on a 44 year-old patient who is 21 days post allogeneic bone marrow transplant for renal cell carcinoma and has developed a deep venous thrombosis (DVT) of the left lower extremity. The patient has a past history of a DVT in the right lower extremity following a right knee injury that led to a 2-week immobilization at age 32. Although the patient was in bed for the first 7 days after the bone marrow transplantation, he has become more mobile in the past 2 weeks. He has also developed abnormal liver function studies which are thought to be due to graft versus host disease. He has been placed on full doses of low molecular weight heparin for the DVT, and the transplant service requests evaluation for a hypercoagulable state. What tests for thrombophilia should be ordered at this time? A 66-year old male is referred because he has noted recent onset intermittent moderate epistaxis requiring medical attention and a prolonged aPTT of 48 sec. He has no past history of bleeding, and his family history is negative for a bleeding disorder. The patient’s family physician recently performed a CBC which showed a hemoglobin of 11.1 gm/dl, a white blood cell count of 11,900/l, and a platelet count of 140,000/l. Your further evaluation shows that there are 61% lymphocytes on the white cell differential and that the hemoglobin and platelet counts are similar to those previously reported. A diagnosis of chronic lymphocytic leukemia (CLL) is made with further testing. A repeat aPTT is 45 seconds, and a 1:1 mixing study is 39 seconds (normal 26-34 sec). What tests should be ordered next? A 5-year old boy presents with ongoing bleeding 24 hours after a tonsillectomy. The surgeon reports moderate bleeding during the procedure, and the mother reports that the bleeding has been steady during the night hours since the surgery. The patient has no history of past bleeding, but he has not had any significant bleeding challenges before this procedure. The platelet count is normal as are the prothrombin time, aPTT, thrombin time, and fibrinogen levels; the hemoglobin is 9.2 gm/dl, decreased from the pre-operative level of 11.2 gm/dl. A bleeding time is normal, and results of the platelet function analyzer (PFA-100) are normal with both the epinephrine+collagen and ADP+collagen cartridges. What further evaluation should be done? A 28 year old woman is referred by her obstetrician for management of increasing thrombocytopenia in the 36th week of her pregnancy. She was evaluated for a decreased platelet count of 31,000/l 6 weeks ago, and she failed a course of prednisone (1 mg/kg) given for presumptive ITP after her bone marrow showed adequate to increased megakaryocytes. Careful questioning reveals that she has a lifelong history of mild bruising and that she has had heavy menstrual periods; her father is also said to have easy bruising, epistaxis requiring medical attention to control it, and bleeding after dental extractions. Initial screening studies show a platelet count of 24,000/l, and a normal prothrombin time, aPTT, thrombin time, and fibrinogen. Further tests show the von Willebrand factor (VWF) activity (Ristocetin cofactor) level is 95%, the VWF antigen level is 102%, and the factor VIII level is 110%. What other tests should be done to arrive at a diagnosis? A consult is requested by the pediatric cardiac surgeon caring for a 5-year old child for a pre-operative evaluation because of a prolonged prothrombin time of 18.1 sec (normal 12.1-14.7), and an aPTT of 51 sec (normal 24.5-34.5). The child’s mother reports that the child has had some bruising and a nosebleed within the past several weeks; there was no evidence of abnormal coagulation studies or bleeding during the patient’s past 3 cardiac procedures, and there is no family history of a bleeding disorder. Your evaluation shows that the thrombin time is also slightly prolonged at 29 sec (normal 14.6-24.5). Mixing studies 1:1 with normal plasma show incomplete correction in both the prothrombin time and aPTT. The platelet count is normal. What studies should be ordered next? A concerned 36-year old woman is referred by an oncologist for evaluation of a prolonged prothrombin time and aPTT prior to a lymph node biopsy. The patient has had mild transient lymphadenopathy, fatigue, and intermittent low-grade fevers; she denies any bleeding symptoms. Medical history reveals that she has had mild thrombocytopenia and a positive Coombs’ test in the past. She also has a history of low B12 levels for which she receives replacement therapy. Her prothrombin time is 16.2 sec (normal 12.1-14.6) and her aPTT is 48 sec (normal 24.5-34.5); the prothrombin time is 14.6 sec with a 1:1 mix with normal plasma, and the aPTT is 36.8 sec with an immediate 1:1 mixing study that increases by 1 sec after 60 minutes at 37C. Her platelet count is 105,000/l. What test(s) should be performed next? You are asked to interpret a bone marrow flow cytometry examination in a 14-year old boy with leukemia. The blasts are HLA-DR-, CD11+, CD13+, CD14-, CD33+, CD41/61-, glycophorin A-. What is the most likely diagnosis? A 13-year old girl is referred for cough, chest pain and dyspnea. No adenopathy or hepatosplenomegaly is noted on physical examination. The bone marrow biopsy is normal. The mediastinal biopsy shows a proliferation of large cells with sclerosis and broad bands of fibrosis. Immunohistochemical stains show that the large cells are CD45+, CD19+, CD20+,CD22+, CD10-, CD15-, CD30- and do not express surface immunoglobulins. What is the most likely diagnosis ? Non-Burkitt small transformed cell lymphoma. A 14-year old girl is referred for evaluation generalized adenopathy, hepatosplenomegaly and a Coombs positive hemolytic anemia. The patient has a younger sister with mild adenopathy and splenomegaly. Pertinent laboratory findings include an Hb of 9.0 gm/dl, 340,000 reticulocytes/l, polyclonal hypergammaglobulinemia, and the presence of a circulating double negative T lymphocyte population ( CD3+, CD4-, CD8- ). What test would be most likely to confirm your diagnosis ? T cell receptor gene rearrangement study. Lower esophageal sphincter contraction is caused by? A bone marrow biopsy slide (H/E); as well as a tissue block are sent for a second opinion. The only history available is that the patient is a 74 year old male with a 4 year history of hepatosplenomegaly. A peritrabecular inflitrate composed of fusiform cells accompanied by fibrosis is noted on the biopsy. Eosinophils and small lymphocytes surround the aggregates of fusiform cells. The remainder of the uninfiltrated marrow appears normal. Which of the following immunohistochemical stains would the most useful in confirming the diagnosis? What is the first significant response of the female human body to whole body heat stress ? A 65-year old man with a 2 year history of progressive cytopenias is referred for evaluation. On physical examination mild splenomegaly is noted. Initial laboratory studies show an Hb of 9.2 gm/dl, WBC of 1,700/ul and a platelet count of 94,000/ul. The bone marrow biopsy is 15% cellular, large aggregates of CD20 positive lymphocytes are present. No dysplasia is seen on the marrow aspirate. Cytogenetic studies are normal. Of the possibilities listed below, which diagnosis fits the data best? A 67 year old woman is referred by her internist for evaluation of axillary and inguinal adenopathy. A CT scan of the abdomen reveals mild splenomegaly and right iliac adenopathy. Flow cytometry, performed on peripheral blood demonstrates a clonal population fo B lymphocytes ( CD19+, CD20+, CD10+, CD23+, CD5- with moderate to strong staining for the kappa light chain ). What is the most likely diagnosis? A 55 year old man has angina. One day, while cleaning the garage, he has a sudden onset of chest pain. He rests for a while, but the pain does not stop. He finally calls an ambulance and is taken to the hospital and is told he had a myocardial infarction. What pathologic process will be predominant a few hours after his myocardial infarction? According to Vaughan Williams Classification of antiarrhythmic Drugs, how would you classify an antiarrhythmic that blocks sodium channels and shortens QT? 2. A blood transfusion center in a third world country are keen to reduce the incidence of posttransfusion hepatitis C in their blood products. Which measure is most likely to reduce the incidence of posttransfusion hepatitis C in this center? A 24yr old man had gone for a hiking trip where he was attacked and bitten by a coyote. 45 year old visits her physician because of respiratory complaints. After analyzing her blood work, she is told that she has a neutrophilic leukocytosis. Which of the following is associated with neutrophilic leukocytosis? A young man develops acute hepatitis B. Four months after his presentation he asks for a test that would predict the likelihood of developing long term disease. Which agent would be most helpful in estimating the likelihood of developing chronic active hepatitis in this patient? A 30-year-old woman presents with the acute onset of fever, pleuritic chest pain, and a productive cough. The patient's history is unremarkable except for recurrent cystitis for which she takes trimethoprim-sulfamethoxazole. She smokes cigarettes. On physical examination her temperature is 40 °C (104 °F), pulse rate is 120/min, respiration rate is 36/min, and blood pressure is 130/80 mm Hg. Abnormalities are localized to the right lung where crackles, rhonchi, and egophony are heard. Oxygen saturation is 85% by pulse oximetry. Chest radiograph shows a right lower lobe pneumonia. Sputum Gram stain is purulent with few epithelial cells and a predominance of gram-positive diplococci. Which of the following antimicrobial agents would be the best initial therapy for this patient? A patient is referred to a neurologist because of ataxia. Neurological examination reveals a loss of proprioception and a wide-based, slapping gait. Magnetic resonance imaging reveals degeneration of the dorsal columns and dorsal roots of the spinal cord. Which of the following organisms is most likely to have caused this pattern of damage? Ipsilateral fibres from the same sided optic nerve end up in which layers of the lateral geniculate ganglion ? Which layers of the lateral geniculate ganglion are made up of cells with large bodies? Which of the following viruses is capable of replication in enucleated cells? according to Vaughan Williams Classification of antiarrhythmic Drugs, how would you classify lignocaine ? According to Vaughan Williams Classification of antiarrhythmic Drugs, which class cause would l-sotalol belong to ? 1.According to Vaughan Williams Classification of anti arrhythmic Drugs, which class would bretylium belong to ? Which of the following is a Beta-1 selective blocker ? A 24yr old man presented to the emergency room with salivation, abdominal cramps and vomiting. He also had lacrimation of the eyes and was in obvious respiratory distress.The man gave history of exposure to parathion. What is the specific antidote for parathion poisoning. A 27 year old female has a routine pre-employment blood test . She is told by her doctor that her red blood cells are smaller than normal. In which of the following conditions would the mean corpuscular volume of the red blood cells be decreased? A 22 year old female complains of fatigue, headaches, and oozing gums. On physical examination, she is found to have a low grade fever, pallor and petechiae. Laboratory tests are done, including a CBC with differential. Her white blood count is 45,000/cu mm and thrombocytopenia. Her blood smear shows numerous blast cells. Auer rods are visualized. She is negative for Philadelphia chromosome. Which of the following is most likely? In a plasma phenytoin concentration of 20microg/ml how much of the phenytoin would be expected to be available for distribution to the site of therapeutic effect ? Q. A 52 year old white male is found to have some abnormalities in his peripheral blood smear. He has anti-intrinsic factor antibodies in his serum. He has a positive Schilling test. He is given a diagnosis of pernicious anemia. He is told that on his differential count, the abnormality was a shift to the right. What is a 'shift to the right'? Where are protease enzymes synthesized in the human cell ? The Cholera enterotoxin causes massive diarrhea through which of the following mechanisms? Q. A 24 year old in-patient has chronic diarrhea as well as a large draining fistula. She complains of nausea and anorexia and of marked weakness. On physical examination her blood pressures is 120/80 mmHg. When she stands up, she feels very dizzy and her blood pressure is 110/70. Her heart rate is 100. She weighs 50 kg. When the intern pinches her forehead skin, it stands up like a tent. Her eyes are sunken. Her laboratory tests are pending. The intern suspects that she has extracellular fluid volume depletion. What volume of water would be expected in the extracellular compartment of a healthy 50 kg female? Which oral hypoglycaemic drug is most likely to induce the syndrome of inappropriate antidiuretic hormone ?